When it comes to art projects, my kids and I are all about “easy” and “simple.” This fall leaf art project could not be easier! The results are lovely and the process is fun. Pair it with our easy fall leaf wreath and you are all set for a glorious autumnal home. 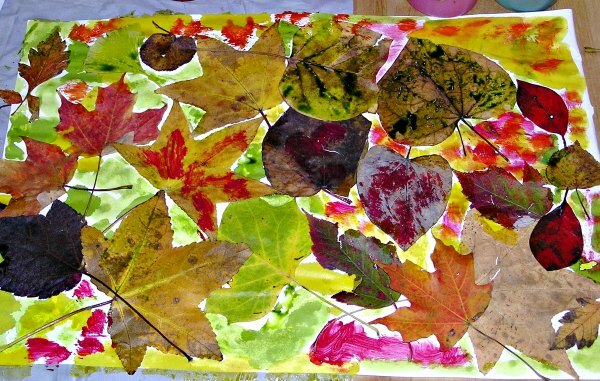 All you need is some glue, paint, paper and, of course, some beautiful, colorful autumn leaves. Glue the leaves on the paper and start painting. 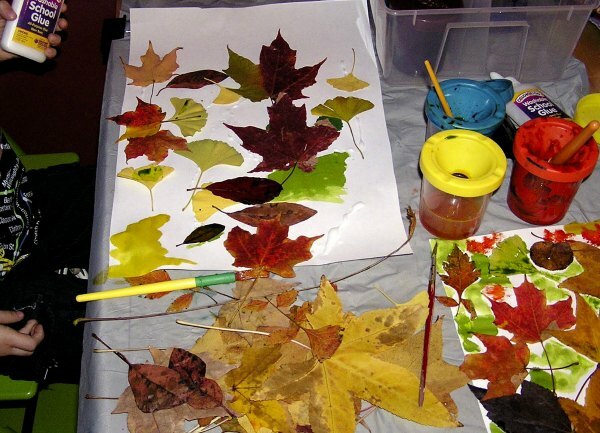 Kids can paint on the leaves, around them — what ever they want! We used liquid watercolors, but any kind of paint will do. Since New Kid was snoozing, I was able to get in on the action. I may have had even more fun than Kiddo. This post contains affiliate links. Thank you for visiting and supporting this blog! Your art is stunning! Like the fact that you kept the leaves on the paper! Thanks for the link love! I'm just now getting around to commenting. I really like that idea. Seems basic enough that mine could probably do it, too. How do you get these great book lists together? I've got all three on reserve at the library now. Do you spend a lot of time gathering the titles? I love the idea. Nellie: I don't really have a system. I usually get on a subject kick (or Kiddo does) and end up requesting a ton of books on that subject, like leaves or pumpkins in the Autumn, or moons, or something like that. When I write a post I take a look at our bookshelf and see if we have any books that I particularly liked about the subject. Sometimes I have books, sometimes not, and sometimes I just recall some good books we read in the past. It's just a little haphazard… like the rest of my life. I loved your simple but cute craft! We've been doing lots of leaf projects too! Lovely leaf art! We love the book, Leaf Man. The art is so inspiring. Thanks. I agree. It's a great book. We're gonna do this today! Thanks!!! Thanks so much for this! 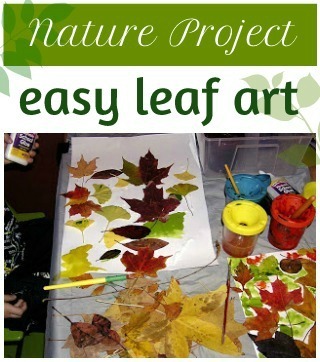 The kids and I will be making our own leaf art very soon as part of our Fall Bucket List challenge! Many blessings!